I haven't really been up to much since returning from my West Wales holiday. I took a bit of a tumble in work, my foot was swollen and blue and now it has cellulitus. Having a blue foot isn't much fun AT ALL and I want it to return to normal so I can go to yoga and get out on my bike now that the days are a bit longer. Silly blue foot stopping my fun. Not bad ey? 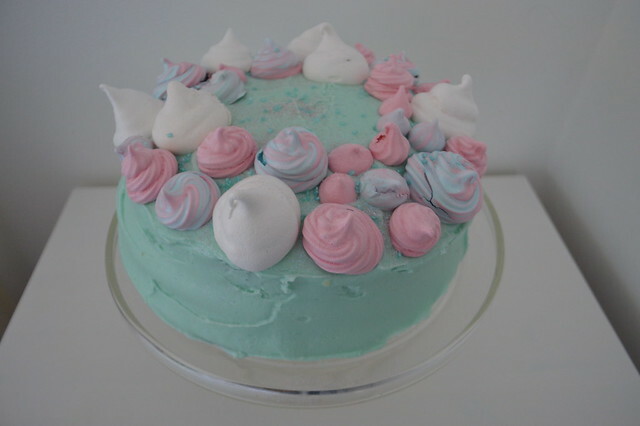 It's a classic sponge cake with blue cream cheese frosting and meringues (meringue recipe here) and edible glitter on top. If you want something amazing you should really hire a professional like Claire. They have all the skills, flair and right equipment. No matter how hard I try my cakes always look a bit shoddy. 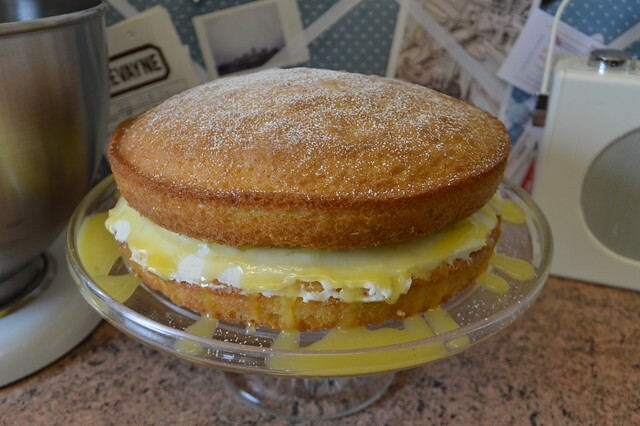 I made some lemon curd with all the leftover egg yolks I had after making meringues and slathered that in the middle of a sponge cake, yum! I like the recipe over on Good Food, classic equal quantity recipe and easy to follow. It looks a bit messy but I'm impatient and assembled the cake before it cooled properly so the curd spread everywhere. 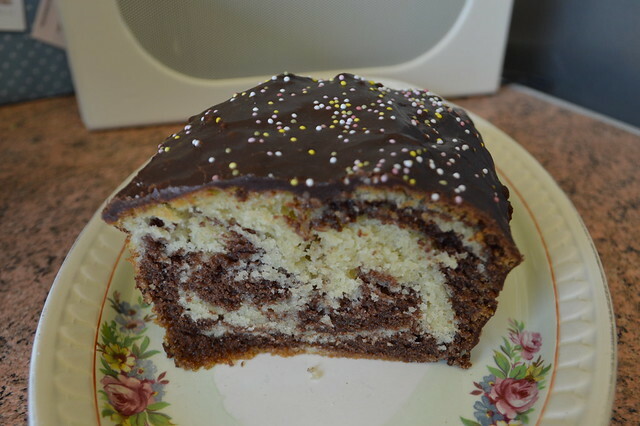 The chocolate marble cake is a Mary Berry recipe and looks like something my nan would have made in the 70s. The cake turned out really well and only lasted a couple of days in my house so I'll be adding this one to me repertoire. I like that you don't really need anything fancy to make this cake, just a loaf tin and basic store cupboard ingredients. I don't really need any more books because my 'to read' pile is huge but it rarely walk past a bookshop without buying something. 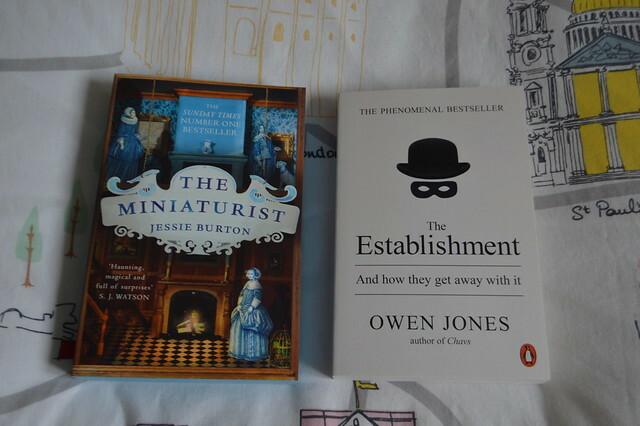 I've got a four day weekend over Easter so I'm going to try and relax, get my foot elevated so it will heal up nicely and read these two new books I bought. I don't really know much about either of the books which I prefer before I start reading something. If it's got a lot of hype and I already know half the plot it kind of spoils it for me. I've read a few of Owen's columns before and seen him on Question Time and he speaks a lot of sense so I'm looking forward to getting stuck into the book. 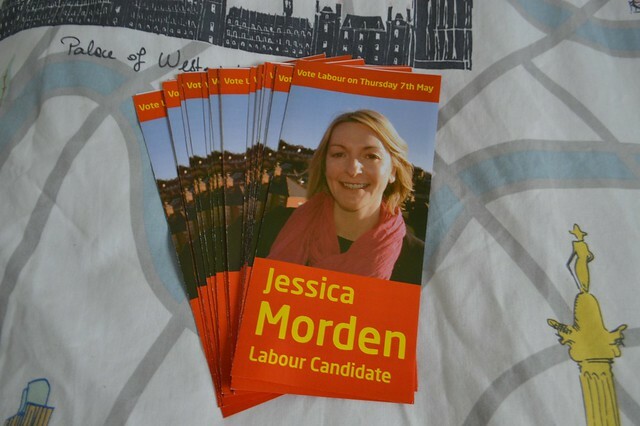 I've been trying to hobble about and deliver some leaflets in my local area in time for the General Election. You can see the party I'm a member of and support below. I'm not going to lecture you or try and persuade you to vote for them but please do vote for someone you believe in. I'm pretty annoyed about zero hour contracts, rising bills for gas and electricity, the Bedroom Tax and tax avoidance so I've been trying to speak to as many people as I can before the election to get them registered to vote and to use it in an informed way. If you want to vote in the General Election on the 7th of May you only have until the 20th April to make sure you're registered. Head over here if you want to do that. If you're a student please check that you're registered and have your polling card. Voting switched from household to individual voter registration. Previously universities put students living in halls of residence on the electoral roll but you have to sign up individually now. I've been lucky enough to see two of my favourite acts live recently. 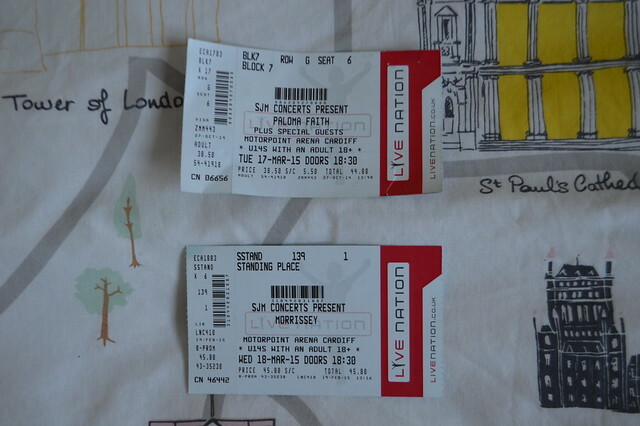 I promised my mum I would get her Paloma Faith tickets for Christmas and they sold out so I begged for tickets on twitter for weeks and managed to get some at face value in the end. The stage was beautiful, I loved her band and the arrangement's on the songs and her backing singers had amazing soul voices. Paloma was funny and as playful as always. She puts on a great show and has more hits that you realise so I would highly recommend seeing her if she's touring in your area or at a festival you're going to this summer. I had been looking forward to seeing Morrissey for ages, I hadn't seen him since 2008 in the Roundhouse and I wanted to share one of my musical heroes with Martyn. Unfortunately I saw Morrissey on the day I fell over and hurt my foot and spent most of the show sitting down at the back crying because it hurt so badly. Foot pain was temporarily forgotten when he sang Suedehead and Every Day Is Like Sunday. What have you been up to recently? Send me your blog links if you've shared something I should be reading, listening to or visiting over Easter. Hope you all have a lovely long weekend! Ah those cakes look delicious!! The pastel cake at the top looks amazing! Hope your foot heals quickly Gemma! How to make a new crop top ready for the summer out of some old winter leggings!? Hope you feel better soon, your cakes look lovely, I need to do some more baking I think! So much to comment on! That first cake looks brilliant, the stuff of fairy tales! I want to try meringues as I've never actually made them and apparently they're really easy. I'll definitely be putting food colouring in them now. Mary Berry is always a safe bet - I have a book of hers from the mid-80s and despite the fact everything looks so BROWN in all the pictures (food photography has come a long way hasn't it?!) it always tastes lovely. I love Owen too and I keep meaning to read my Dad's copy of Chavs, just never have a spare minute. Well done you for getting out and canvassing! I for one am hoping for a Labour-SNP partnership, especially after watching the debate. Meringues are soo easy, definitely follow the Meringue Girl recipe I linked to above as it was a good one to follow with lots of tips. You can buy a bottle of egg whites now (madness) or use the leftover yolks to make lemon curd like I did mmm. Hoping for a Labour govt propped up by the Greens and nationalists. I feel like I have to do my bit. Even if it's getting people to register or engage them in anyway.